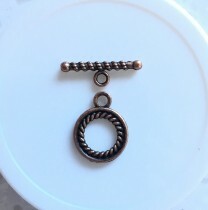 Toggle / clasp, antique copper-plated “pewter” (zinc-based alloy). 12mm round. 5 sets per pack. Toggle / clasp. antique copper-plated “pewter” (zinc-based alloy). 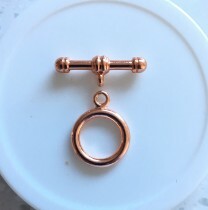 16mm double-sided round with rope design. 3 sets per pack. 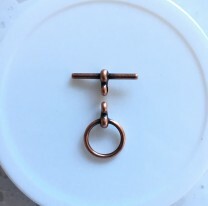 Toggle / clasp, copper. 18mm textured round with twist. 1 set per pack. 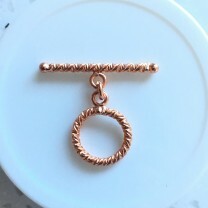 Handcrafted copper toggle clasps are lightweight and offer versatile design potential. The textured surface adds an edgy, modern look to design. Due to the handcrafted nature of the clasps, size, shape and colour may vary slightly. 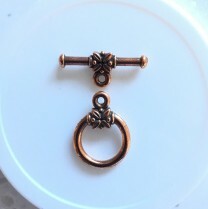 Toggle / clasp, copper-plated brass. 16mm round. 3 sets per pack. Toggle / clasp. Tierra Cast brand. 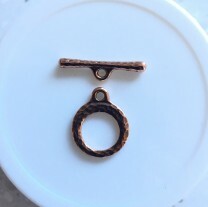 Antique copper plated hammered 16.75mm round. 1 set per pack. Toggle / clasp. Tierra Cast brand. Antique copper-plated base metal. 22mm smooth round. 2 sets per pack. Copyright © Preciouz Piecez 2012. All rights reserved.